I had to leave my DIY spice rack behind in Nova Scotia when we moved. My current setup isn’t the greatest. I have them stashed in a couple kitchen drawers and the rest of the spices are strewn in the pantry. Needless to say, my spices need some TLC! 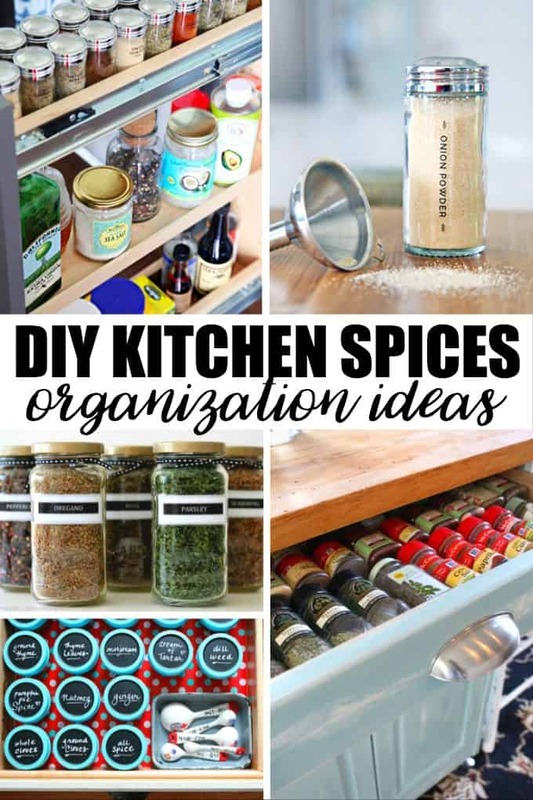 I was looking for ideas and found these creative DIY kitchen spices organization ideas to help get them into order. If your spices need a little help too, you’ll want to check out these DIY’s below! The question is which one do I use! How do you have your spices organized? Some really great ideas, my spices are all over the place. I really should get them organized. I’m thinking about doing the drawer idea, I have to do something! Every time I open the cabinet, spices roll out all over the place. My spices are a total mess! I have them shoved into plastic bins and some on a shelf. I could use a good spice rack too! I have a carousel on my counter and then I have odd jars stuck in the back of one of the drawers! I really should get my pantry organized before Spring arrives,great tips thanks!